Financing Available: 10% down, $250/month (minimum), 7% interest -- have it paid off in just 15 months! 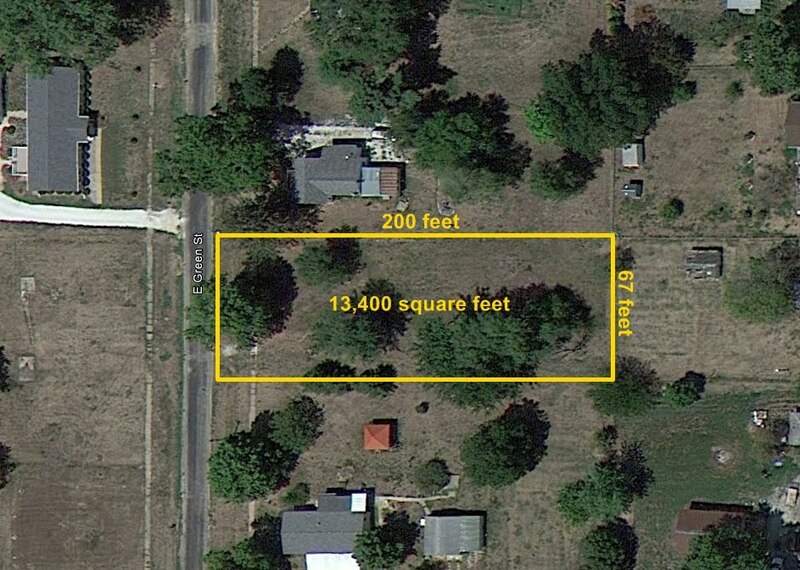 This is a very affordable 67' x 200' lot in Augusta, IL. The lot size is 13,400 square feet and it is a flat lot with access off of East Green St. It would be the perfect place for you to build a house with a garden and a fenced in back yard. It would also be a great investment property to hold onto for a while and either re-sell down the road or build on whenever you want. The property is being sold as-is and will be conveyed by a quitclaim deed. The buyer is welcome to get title insurance on the property at their own expense. It is up to the buyer to determine whether this property will be suitable for what they want to do with it for the simple reason that we cannot research all possible uses of the property to determine if this or that will be allowed or not allowed. The aerial image below was taken in July 2012 and shows the boundaries of the property. Unlike many sellers of real estate, we are willing to work with buyers to find a financing solution that is affordable and meets your needs. You can purchase this property one of two ways. The first is with a cash offer, either with cash from savings or from a bank loan. The second is to get financing from us in the form of a contract-for-deed, which is a form of seller financing that helps buyers avoid the difficult and costly process of going through a bank to obtain a mortgage loan. The minimum requirements for this type of arrangement is: 1) a 10% downpayment; 2) monthly payments of at least $250; and 3) interest of 7.0% per year on the balance of the loan. Paying more per month would reduce the length of the financing and there are no penalties for paying it down early. Once the last payment has been made, the deed will be transferred to the buyer.